Your newly independent toddler is happily chatting up a storm. However, after waiting for him to begin speaking since he was a baby, it is now difficult to understand everything he is saying. Articulating sounds such as "S" are common concerns among parents of toddlers. Like the muscles in his limbs and body, your toddler must learn to control the muscles in his tongue and mouth and connect them to his teeth, to make the right sounds as he speaks. His speech will improve as he grows and develops. You can help your toddler with speech exercises and plenty of practice. Your toddler may have problems articulating the "S" sound because it is made with the teeth and tongue. Pam Gentry, educator and speech therapist, in an article for International Children's Education, advises that at this age parents may also notice a problem with pronunciation of other sounds as well. Sounds requiring special placement of the tongue, including s, r, l and th, are the most difficult for a toddler to say. Sounds that are articulated through the front of the mouth and lips are the easiest to acquire. Your child likely said these sounds such as m, n, p, b, t and d first. Like most kids, your toddler's pronunciation of difficult sounds such as "S" will improve as he grows and develops. You can help him listen to the sounds and practice them with simple exercises. Have your child repeat words that sound similar but replace the first letter with the "S" sound. For example, use pairs of words such as "tent" and "sent," "tip" and "sip," and "toe" and "sew." Use these words in a rhyme or find them in a picture book to make this exercise a fun activity for your toddler. The American Speech-Language and Hearing Association also recommends straw drinking as a mouth exercise for oral motor development. Look in the child dishes or utensils section of retailers to find a sipping cup with an attached straw. Sucking strengthens the muscles of the cheeks, tongue and mouth, helping your toddler to pronounce sounds such as "S" and "F" that require these muscles. 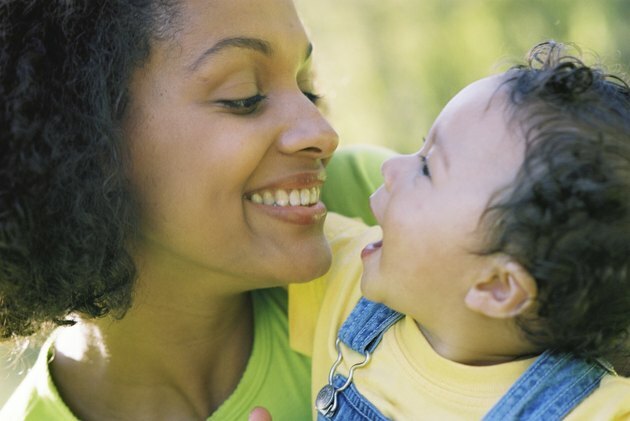 Practicing speech will help your toddler improve how he pronounces all his sounds and words. The American Speech-Language and Hearing Association recommends several ways and activities that you can use to help your child speak more clearly. Use clear, simple speech when speaking to your toddler. Repeat what your toddler says to let him know you understand him. Build and expand what he says and wait for him to repeat it. "Want apple? Do you want an apple? How about an apple with peanut butter?" Ask your toddler questions that require him to voice a choice instead of just "yes" or "no" such as "Do you want to drink apple juice or orange juice?" Help your toddler expand his vocabulary by including new sound words and naming body parts, colors and things you see. Your toddler's doctor or dentist can determine whether his dental health is causing a speech impediment. Teach Me To Talk, a site that provides resources to help professionals and parents teach toddlers to understand and use language, notes that an open bite or a gap between the upper and lower teeth can make it difficult for your toddler to learn to make certain sounds with his tongue and teeth. Gaps in the teeth are often linked to using pacifiers, bottle feeders or sipping cups for too long. If your toddler still needs these, wean him off slowly by using them at nap time only. Listening to your child is an important part of communicating. However, it is easy to focus on the words your toddler is having difficulty saying rather than what he is saying. As your toddler develops language skills and learns to combine words and phrases, he will stumble over sounds and words. It is important to gently correct your toddler and listen to him without insisting that he repeat the word. Speech and Language Kids, a site that provides activities and resources for parents of children with language delays, warns that overcorrecting or repeating words too often can lead to frustration for your toddler. He can become angry or insecure about speaking, delaying progress in his speech. International Children's Education: Children’s Speech: When Should a Parent be Concerned?